1. In a large bowl, cream butter and sugar until light and fluffy. Add eggs, one at a time, beating well after each addition. Beat in almond extract. Combine the flour, baking soda, and salt; gradually add to the creamed mixture and mix well. Stir in chips and cherries. 2. Drop by rounded tablespoons 2 inches apart onto ungreased baking sheets. Bake @ 350 for 10-12 minutes or until lightly browned. Remove to wire racks to cool. 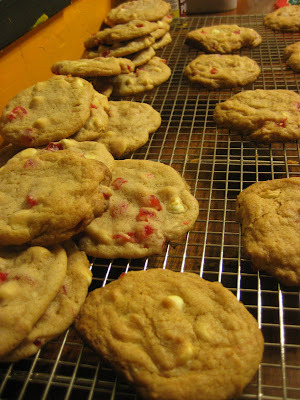 REVIEW: I don't think I will make this cookie again, so it is tossed. 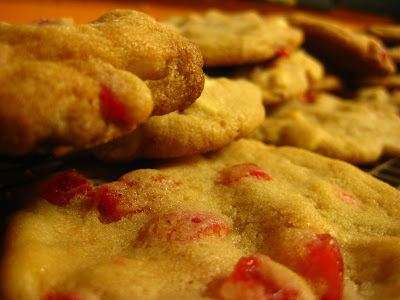 Most people thought the cookies were good, but they wished they did not have the cherries in there. I don't think anyone actually said they liked the cherries. Lots picked them out and ate the rest, pretty much defeating the purpose of this recipe. You could just make chocolate chip cookies and use white chips and it would be the same thing. Nobody said they would request this recipe. 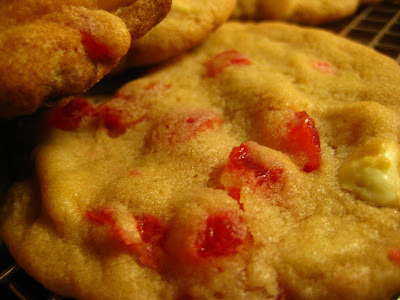 I would encourage you to try it out, especially if you know someone who likes maraschino cherries (however one of my testers loves maraschino cherries, but did not like them chopped into this cookie!!). If you try it out, let me know what you think of it! But for now, this recipe is not going to make it in my cookbook! !